Not long ago I read this wonderful and amazing book called The Illusion of Life by Frank Thomas and Ollie Johnston. It’s a great resource for animators, but I found that it was wildly inspirational for my story-obsessed self. In it, there was the story about how Snow White came to be what it is. I think, sometimes, we forget that life was vastly different a hundred years ago. Doing amazing things, like talking to a person across the country, took time. Creating roadways took even more time. And creating an animated film was more strenuous and labored than that. Not only that, but Walt Disney and his team were THE pioneers in animation. I love to look back and see what influenced these animators and how they practiced. There were short films prior to Snow White that helped them prepare for the subtlety needed for a full length feature film. Like the Goddess of Spring for example. This short film helped the animators figure out how to animate a young girl's arms. Then the tortoise and the hare had to have some influence on what woodland creatures were in the story. It would make sense to include creatures that had been 'figured out' before. Like birds and rabbits. The story itself is incredibly simple. The evil queen is pointed out straight away, along with Snow White's innocence. It seems to me that the theme is truly about love. The evil queen goes about loving herself - and herself only, whereas Snow White spends most of her time loving everyone else. That is her most appealing characteristic. She's just waiting for someone to love her. She even prays that Grumpy might like her. I love how the background painters chose a peacock to adorn the vain queen's throne. Even the composition pointed directly to her impending spiral into madness. Also, I wonder what made them choose lime green for the color of evil eyes? 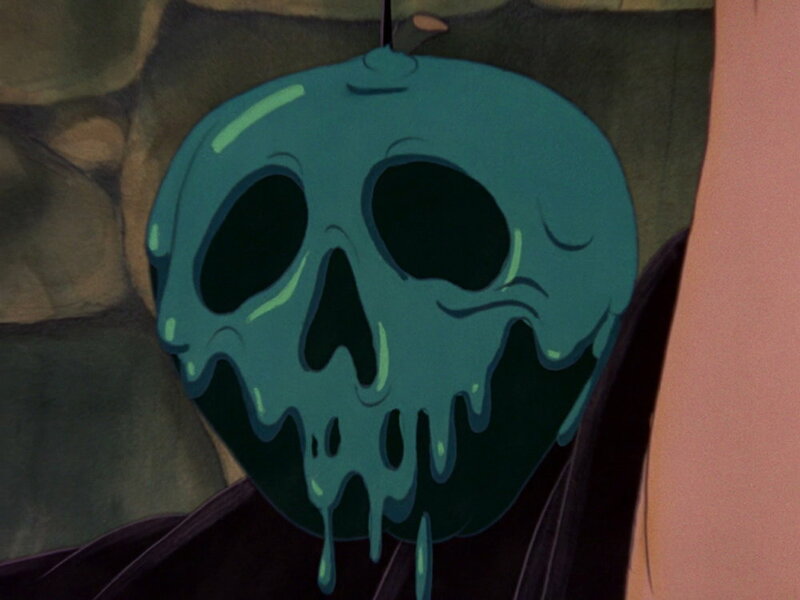 One of the most dramatic points in the film is the scene where the Hunter is supposed to kill Snow White and is discussed at length in The Illusion of Life. It is also the scene I chose to study for my storyboards. This stuff is intense! But it really ups the ante for the rest of the film. The audience is now primed for Snow White to die. Talk about false positives. And it's such a simple thing to do. By the way, in case there was any doubt about the 'love theme' hypothesis, consider the queen's reaction to the poisoned apple antidote. "Love's first kiss...bah! No fear of that!" That face is the face of someone who's never heard or has never believed in love. So, if the story is about love and the protagonist gives love and the antagonist loves herself only... where's the change? This is where the dwarfs play a great role. The greatest change can be found in the character of Grumpy. Grumpy who, when we first meet him, despises love. And then in the end, learns to love Snow White. Indeed, he has more frames on him when they chase down the evil queen. While all the dwarfs are heroes, Grumpy is the one that changes the most. I began this post talking about the time period this film was made in. While the story was very concise, there were moments, like the fly sleeping on Sleepy's nose, the millions of chipmunks scurrying about, the animals doing laundry, etc. that might feel out of place or seem to slow the story down or could have been cut. I have to remember that the filmmakers were going for entertainment when entertainment was something very different idea than today. Like putting laundry on a deer might seem superfluous, except that it's entertaining (and it also helps establish Snow White's uncanny bond with woodland creatures, which may very well be the unsung heroes of the whole movie, but I digress). Things that withstand the test of time have something of true substance to them and Snow White is one of those things. It is not my favorite film, but it still leaves me in awe. It set the precedent for all animated films after it.